Its fall here but I still remember summer as if it was yesterday. Well, part of it must be because it has not gotten really cold yet, atleast for October. A good number of days during the week I am still able to walk out in a tee and be very comfortable. It does get a little chilly at night but again, it does not feel like November is almost here. We had so many great hot days in summer that we put our deck to good use. For the most part of summer, we ate out on the deck for dinner and sometimes breakfast and lunch too. And on some particularly hot days when I did not feel like cooking a lot, I used to put together meals that involved very less or no cooking at all. 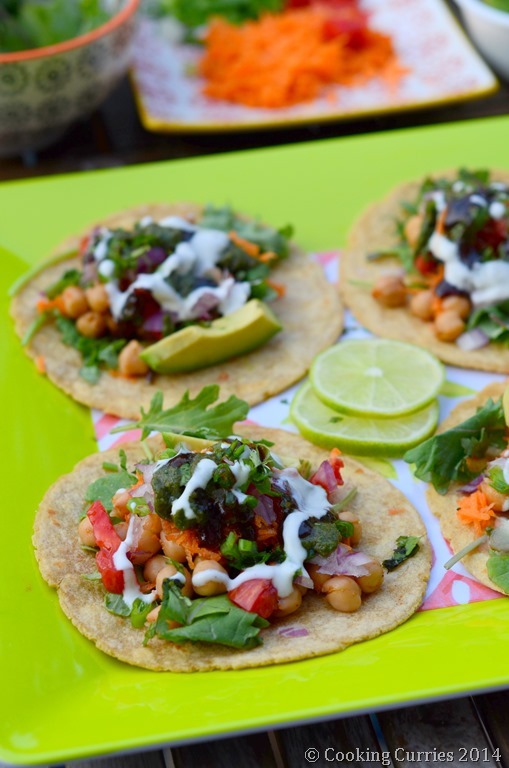 This Chana Chat Tacos was that kind of a dinner. 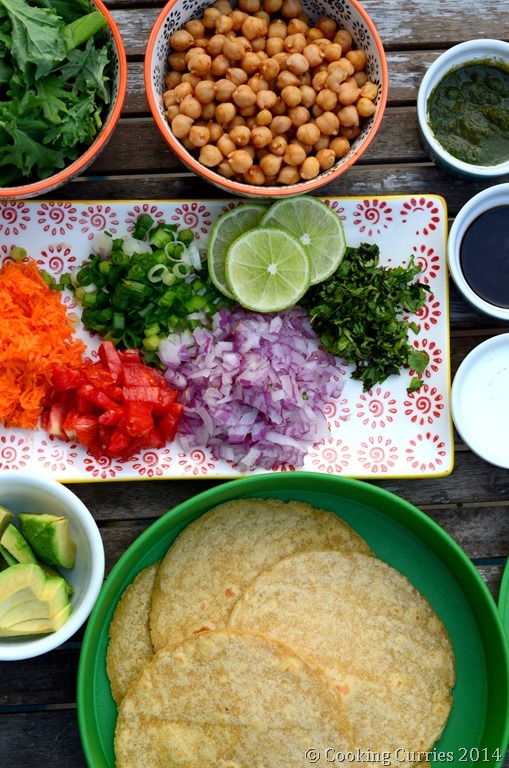 This is a no cook meal (assuming warming up tortillas don’t count as cooking) – just gather up all the toppings, assemble away and devour away. Warm the tortillas and keep in a tortilla warmer. Mix the 1 tsp chat masala and 1/2 tsp cayenne with the garbanzo beans and add a little salt and black pepper. Mix well and keep in a bowl. Now to the yogurt, add the 1/2 tsp chat masala, salt and black pepper and mix it in. Lay out all four tortillas on a server. Top with a little of the baby kale, garbanzo beans mix, onions, tomatoes, carrots, scallions, cilantro, a slice or two of avocado. Drizzle some cilantro mint chutney, dates tamarind chutney and the yogurt mix over it. 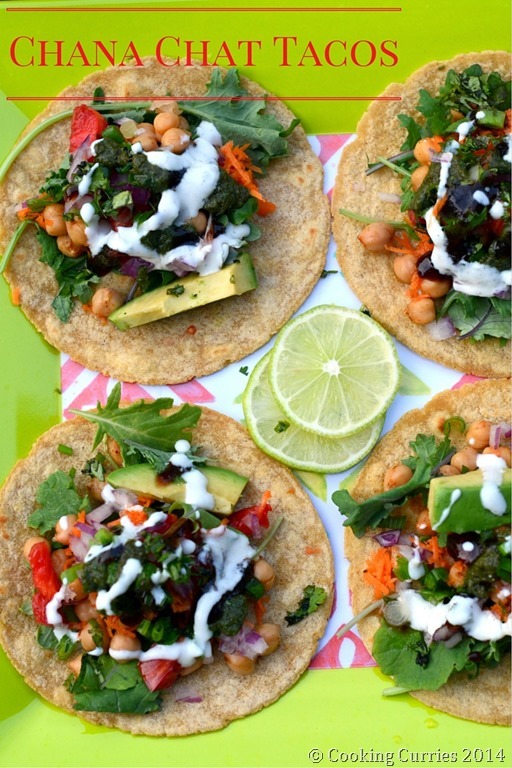 Squeeze a little lime on top of all that and your chana chat tacos is now ready to be dug into! This is so awesome. I can already imagine the explosion of flavors in this fusion dish!